This guide will teach you how to add an employee and completely configure an employees settings. If you want to add all your employees in one hit, view the import employees guide. 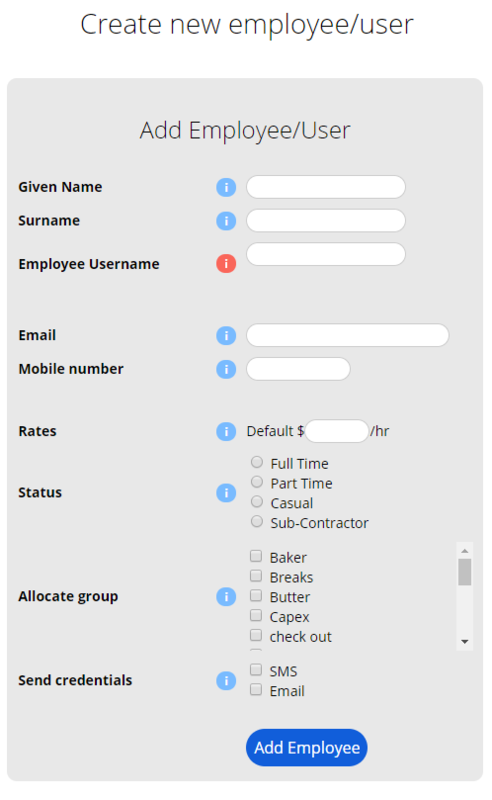 A username of your choice is assigned to the employee. After you add an employee, a 6 digit number will be assigned as their default password. The employee will use these credentials to access the Employee Console. Once you have added all your employees, you can produce a welcome letter that will introduce them to the Microkeeper system and inform them of their username and default password. When an employee is first added to the Microkeeper system, default values are pre-selected, this gives the employee the ability to starting clocking their hours. Before their first payroll can be processed, the configuration of the employees account must be configured. The configuration of the employee can be done as required. The info dots i will help explain any of the finer details. Note: We recommended getting a bookkeeper or someone with an accounting background to help with the initial configuration.